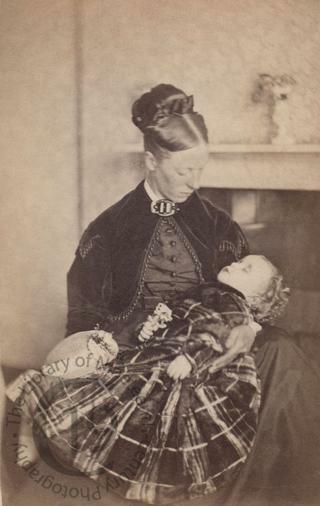 The dead child in this carte-de-visite portrait is Grace Agatha Boughton Leigh, the daughter of the Reverend Egerton Boughton Leigh. She was born in early 1868 and baptised by her father on 11 February 1868 in the church where he had just become the Rector, at Harborough Magna in Warwickshire. She died eighteen months later at the Rectory in Harborough Magna and was buried on 27 April 1869. An inked inscription on the back of the mount, which reads ‘Dear Little Dotty /taken Saturday / April 24th 1869,’ was presumably written by her mother Alice, the woman holding her body in this last portrait. The following year the poor woman had to endure another loss when her husband died suddenly on 2 September 1870. Two months after his death, she gave birth to a posthumous daughter, whom she name Grace Ada.